A small kitchen is ever a homemaker’s worst nightmare, but with the right design, any kitchen can feel spacious. From paint color to flooring and cabinetry, where you locate them and which ones you choose, can make a real difference in how big your kitchen feels. The galley layout design is perfect for smaller kitchens. In this design, the cabinetry and appliances are arranged against opposite walls. Full-height cabinets can be used in the galley layout can be a good option to take full advantage of precious wall space. 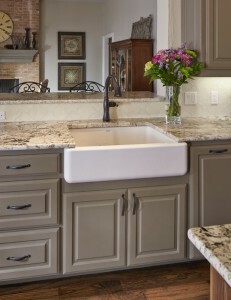 Exposed cabinetry is another great option for small kitchen spaces. The open shelving gives will give your kitchen an airy, roomy feel. Light-colored paint on either the walls or cabins can create the impression of spaciousness in cramped quarters. Tying your kitchen style into the adjoining room can make the compact space feel larger. You can use the same flooring, color or cabinetry to tie in the rooms. The kitchen will seem larger because it has a sense of unity. Small kitchen desires require some thoughtful planning, but with a few tricks from the trade, any kitchen can appear to be larger than it really is.